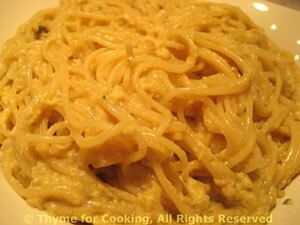 Noodles in Egg Sauce, pasta with an Asian twist, Thyme for Cooking. I use spaghetti for this, but rice noodles should work, as well. The simmering stock is whisked into the eggs to 'temper' them, so they will be more like a sauce than scrambled eggs. Trim and slice green onion. Heat oils in drained pasta pan, over medium heat. Add green onion and sauté lightly, about 1 minute. Add stock, sherry and soy sauce; bring to a simmer. Reduce heat to medium low. When stock is simmering, whisk 2 tbs of hot stock into eggs. Immediately whisk eggs into hot stock. Immediately after that add pasta, stirring and tossing to heat through and coat noodles without curdling eggs. (Tongs work best.) Serve.